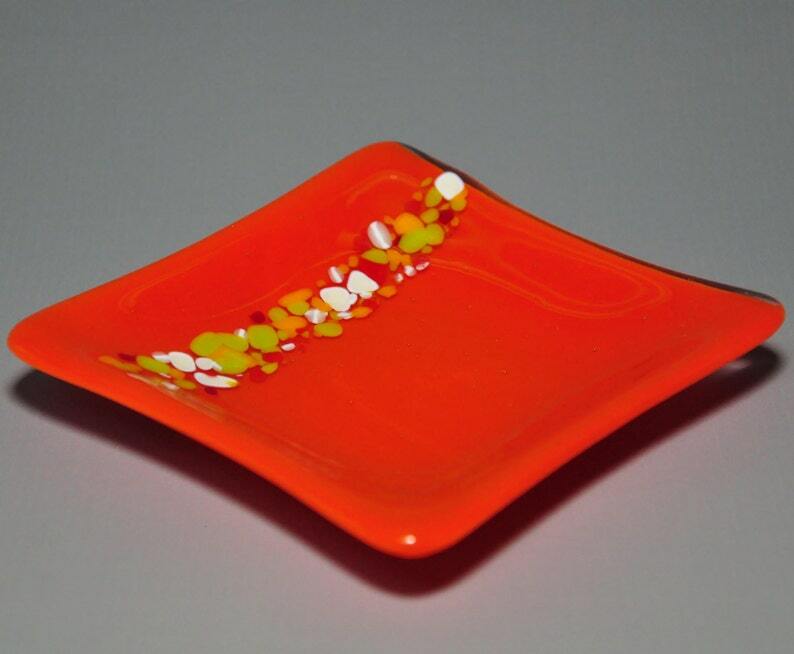 This simple yet beautiful sushi dish is made from a bright orange glass decorated with small pieces of complementary colored glass in a line along the side. It is very sturdy and versatile and can be used to hold keys, snacks, dip, jewelry, or whatever else you can think of! It measures approximately 5 inches square and is raised 1 inch (2.5cm) at the edges. It is lead free, food safe , dishwasher safe and incredibly durable. This unique dish was created in my studio over a 3 day process- designing, cutting and layering the glass, followed by 14 hours in the kiln to fuse the glass into a single sheet, and finally another 14 hours of slumping the glass into the curved dish shape. This dish is extremely durable and should provide you MANY years of enjoyment (even more if you don't use it in the microwave or dishwasher)!